5160 Spring Steel Chinese Jian. Incredibly fast and lightweight (1.42lbs) yet with forceful cuts and deadly accurate in the thrust. It is very hard to find a truly functional and affordable Chinese Jian. Now personally, I am not a Chinese Martial Arts Practitioner (well, a few years of Wing Chun and Yue Fei empty handed Kung fu, but no formal weapons training) so while I really liked this sword, and mentioned previously it was one of my favorites during my visit to the forge (my exact words were "I found it very hard to put this one down") - it is not quite balanced to the exacting requirements of Chinese Martial Arts Practitioners. It has an 'aged and battle-ready look.' There is a no-fuss, all-business and minimalist almost Zen-monk like aesthetic to the sword. (I think collectors will like the 'Zen-monk' description of it). Brown and black are the 'Chan' or Zen colours in China. You could say the guard is a 'matte black,bat-shaped guard.' The bat has positive connotations in China- and cool factor. Dignified and elegant in appearance. -The broad, strong blade is well weighted for quick, accurate thrusting and advance lunges. 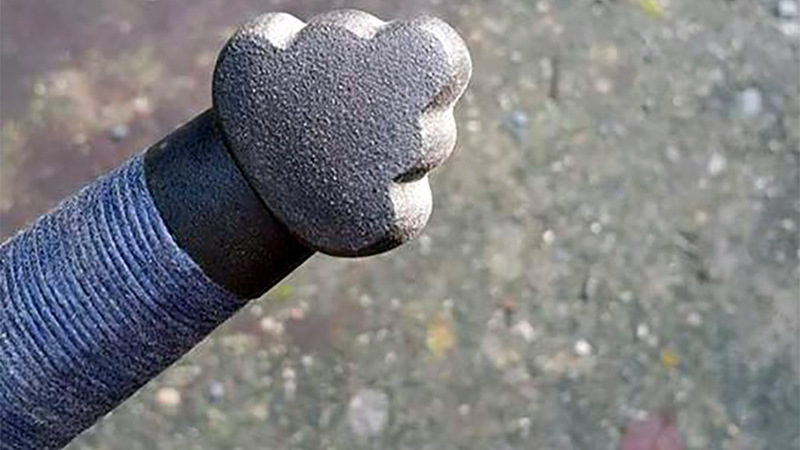 It has the right strength for powerful 'stop-thrusts' and good 'pressing-power'. The very sharp, stable and substantial blade is well gripped by the light weight cord-bound handle that allows for a sense of powerful extension of your arm in cutting. 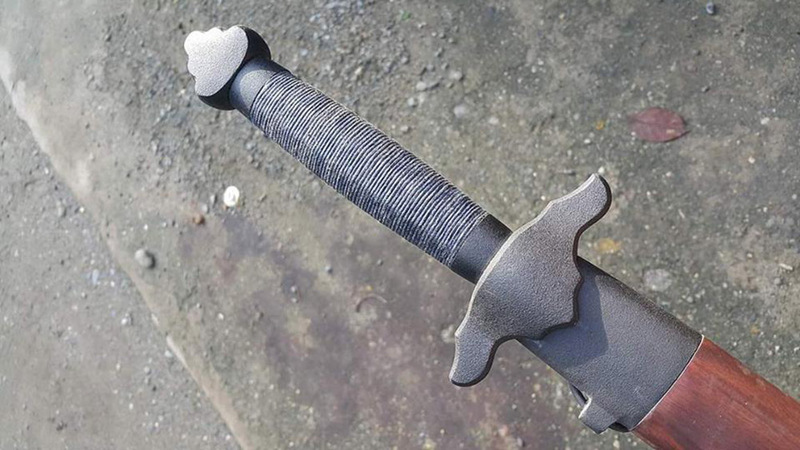 The balance point and strength of the blade provide a strong sense of 'forte' (the part of the blade from mid-sword to hilt) for stable parrying. The blade is perfectly suited for a confident 'hanging guard'. The lightweight, minimalist scabbard keeps the overall feeling of lightness and readiness to the whole piece. 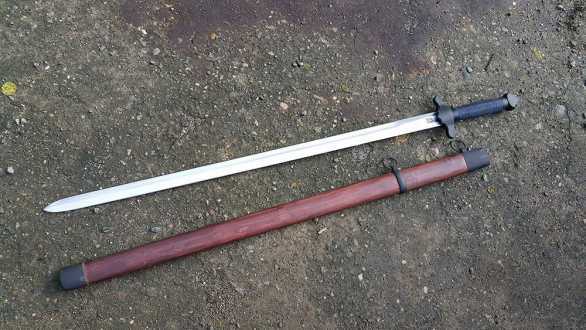 So while we did not quite hit the mark for a functional Jian to suit the needs of advanced Chinese Martial Arts Practitioners, for more casual collectors - it is an impressive piece and if you are like me, you will love it - especially at this special price. So give it a try, you have nothing to lose with our 30 day trial period. PLEASE NOTE: Because of the cost shipping swords two ways internationally, this offer is only available to US based customers. 5160 Spring Steel Sharpened Blade. Aluminum alloy flat black finish fittings. Wax cord wrapped handle over Mahogany wood. 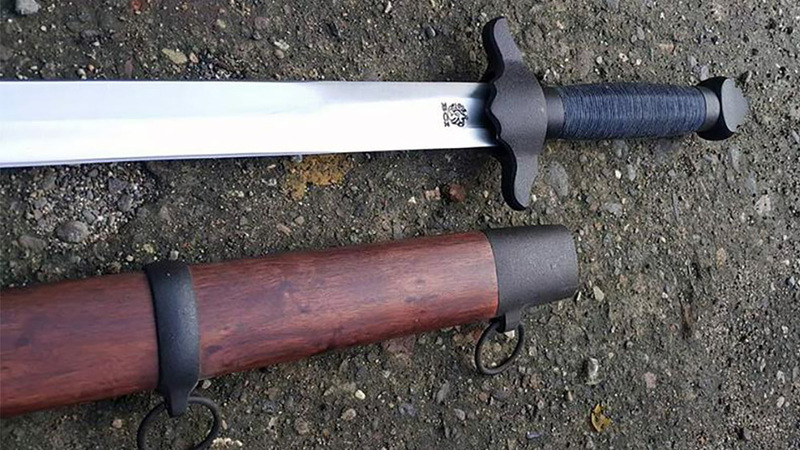 Lightweight Mahogany Scabbard with Rosewood finish and flat black aluminum alloy fittings. Premium Quality Construction. 30 day 'try before you buy' return option. 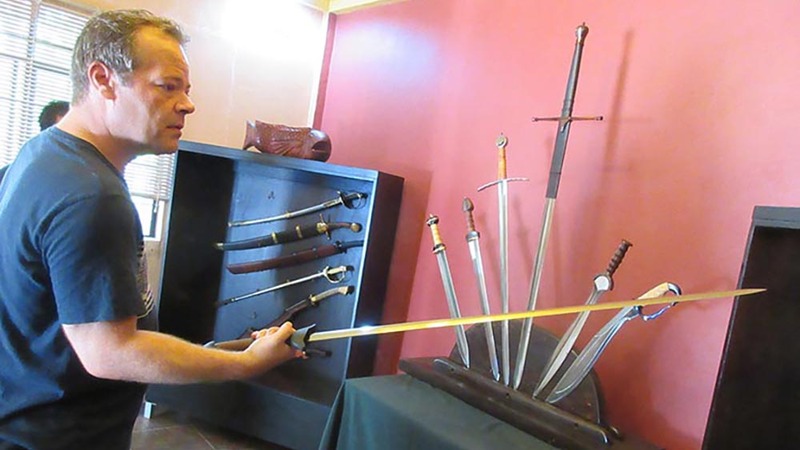 Take a full 30 days from delivery to inspect the sword, do some dry handling - but using it for cutting or modifying or damaging the sword will void the return option. If within 30 days of receipt you decide not to keep it, simply contact us to arrange it to be returned and we will refund you in full within 2 business days of receiving it back in stock.